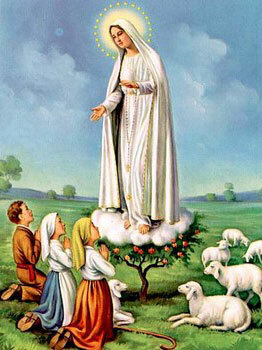 Shortly after me and Daniel converted to Catholicism, I heard about the story of Our Lady of Fatima. 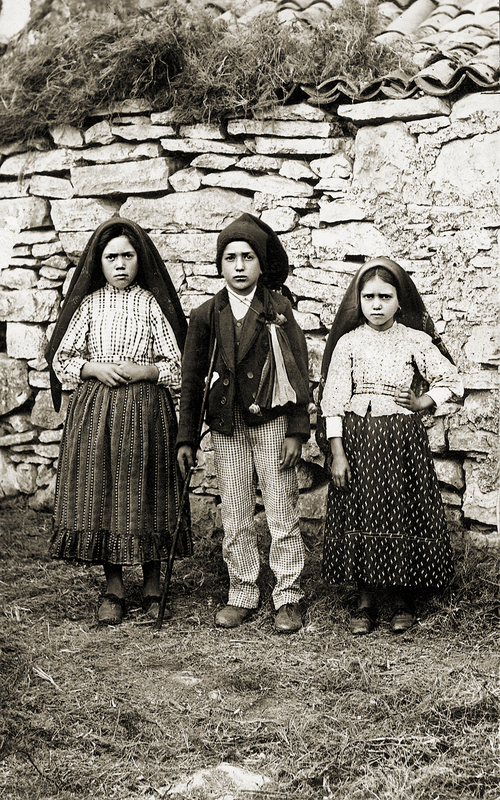 Basically an angel appeared to 3 children in the rural town of Fatima, Portugal in 1917 3 times and taught them prayers and the like. Then on May 13, they saw a lady “brighter than the sun” who told them to come back on the 13th of every month for 6 months. Jump ahead to October 13th, 1917 (98 years ago today). News spread about these apparitions and approximately 70,000 people—skeptics, religious, news organizations came in the pouring rain to see what would really happen at noon that day like the lady promised to the children. And then at high noon, the Miracle of The Sun happened: “The sun turned everything to different colours—yellow, blue and white. Then it shook and trembled. It looked like a wheel of fire that was going to fall on the people. They began to cry out, “We shall all be killed!” Others called to our Lady to save them. They recited acts of contrition. One woman began to confess her sins aloud, advertising that she had done this and that…. When at last the sun stopped leaping and moving, we all breathed our relief. We were still alive, and the miracle which the children had foretold, had been seen by everyone.”. There are numerous other accounts of what happened here. Once I heard about this, I was completely shocked. As a child, I had a few dreams (ahem, nightmares then) where it was the end of the world and I would be standing in the street of my childhood neighborhood staring up at the sun as it was swirling and zigzagging through the sky towards Earth. These accounts were exactly what I had seen in my dreams! I just can’t get over the fact that as a kid, I had this seed planted in my mind that years later revealed itself to be completely divine. Just in case you need a reminder, my daughter is named PRIMROSE LUCIA. I never felt a true connection with Saint Lucy or any of the Saint Roses in relation to Prim, but once I read Lucia de Jesus Rosa dos Santos, mind=blown. I would say that I was stretching the connection a little too far, but I think the immediate lump in my throat and tears in my eyes means that it was a little more than just a coincidence. Anyone else have connections and revelations like that? *** I just found out that a friend from jr high/highschool passed away today. Please pray for him, his family, and the huge community of support he left behind. Thanks! What an awesome patron for your Primrose! When we knew our son was going to be a preemie but didn’t know *how much* of a preemie, we started praying to Our Lady of Guadalupe, patroness of the unborn whose feast day on Dec 12 should that have been his birthday, would definitely put him on the safer side of preemie-dom. Instead he came on Oct 13. But since it was still Our Lady of Fatima’s day, it felt like a little wink from her that all would be well. And miraculously, it was! That is so amazing! Love that. Here is mine. When I was pregnant with our fourth I got this eye disease called iritis. I could have gone blind and it was painful. I ended up being fine. My vision is normal still. So when we were picking out a name we decided on Clara. After she was born I was looking up her names day. Come to find out St Clare is the patron saint of eye diseases and eye soreness. I had no idea. Whoa! That is so wonderful. Such a great connection.